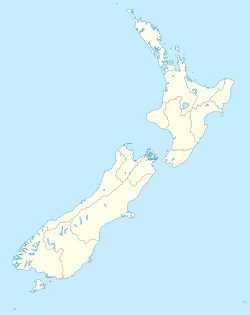 Lumsden (Māori: Oreti) is a town in Southland, New Zealand. Lying in a gap in the surrounding hills, it is the location of a major junction halfway along the north-south road from Queenstown to Invercargill, where it is crossed by the east-west road from Gore to Te Anau. The town had a population of 405 at the 2013 census. Originally the district in general was known as The Elbow. When this name was given to the then new railway station, residents of Castlerock, then also known as The Elbow and on the opposite bank of the Oreti River, brought the matter to George Lumsden of the Otago Provincial Council. He referred that matter to the Railways Department who, in the absence of any other suggestion, chose the name Lumsden for the town. Lumsden also used to be a major railway junction with lines departing to all four points of the compass. The Kingston Branch from Invercargill ran north-south through the town, while to the west was the Mossburn Branch and to the east was the Waimea Plains Railway that connected with the Main South Line in Gore. In 1971, most of the Waimea Plains Railway closed, but sixteen kilometres from Lumsden to Balfour remained open until 1978. In 1979, the line north to Kingston was closed after repairs to flood damage would not have been economic, and both the Mossburn Branch and the connection south to Invercargill closed in December 1982. The railway station is now preserved as a tourist information centre. The Lumsden Heritage Trust has displayed the chassis of New Zealand Railways steam locomotive P60 at the town's southern entrance, as well as two Drewry diesel shunters and three wagons by the old station, to commemorate its former prominent status in New Zealand's national rail network. Lumsden has both a primary and a secondary school (Northern Southland College). ^ Hamilton, G.A. History of Northern Southland. The Southland Times Company Ltd., Invercargill, 1952, reprinted 1971. This page was last edited on 18 March 2019, at 10:42 (UTC).